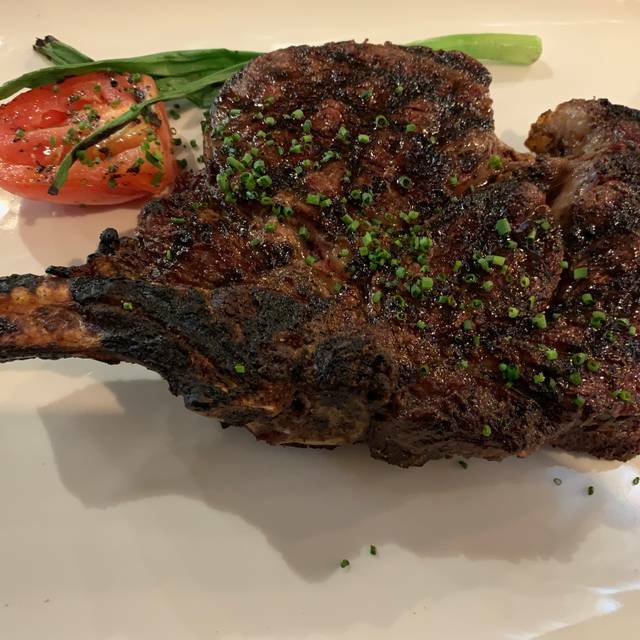 A marketer of the finest meats to connoisseurs who demand the best, The Kitchen at Cooper's offers a wide variety of steaks, chops, burgers and more. We also carry a wide variety of wines by glass and bottle. At The Kitchen at Cooper's we are a fine steakhouse in a casual setting. 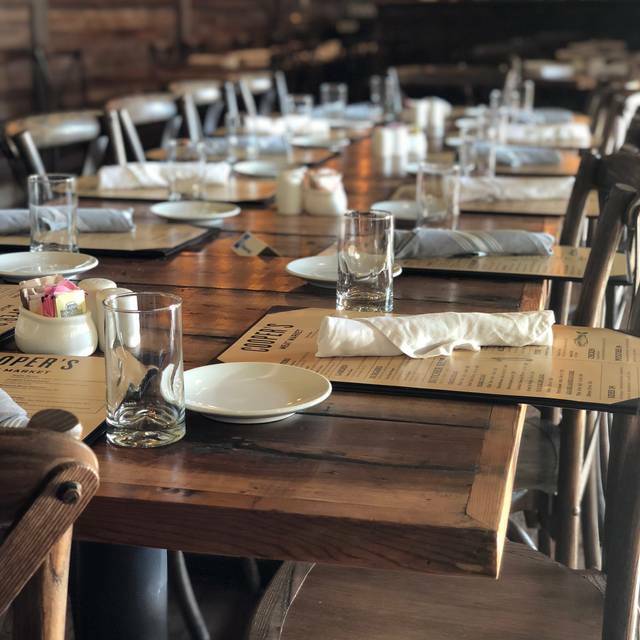 Everyone is welcome as though you were sitting with the family at the ranch house enjoying an amazing meal after a long day of work. We are located at 778 Ft. Worth Ave, Suite G150, Dallas, TX 75208 in the Sylvan | Thirty Shopping Center next to Cox Farms Market. 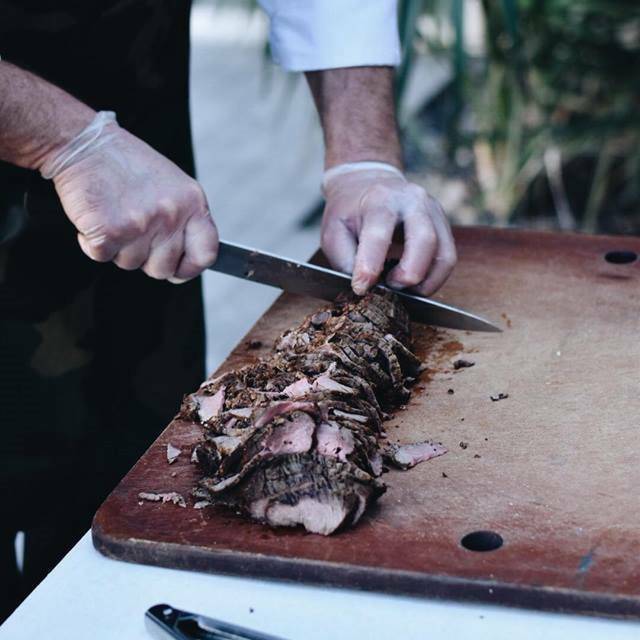 Cooper's Meat Market and The Kitchen at Cooper's offers a wide variety of catering options both onsite and offsite. Please contact Michael Johnson at 214.200.4128 for more information. Served daily between 11-4pm, Monday thru Thursday. 11am-4pm, Friday and Saturday. 10am-5pm, Sunday. Mixed greens, tomatoes, avocado, heart of palm and a vinaigrette dressing. Romaine, anchovy, garlic croutons, parmesan, vinaigrette. with tomatoes, bacon lardon, blue cheese dressing and crumbles. Romaine, radish, cucumbers, crab with a tomato aioli. Served with fries, upgrade fries for $4 more. Ground chuck mixed with smoked brisket and topped with house made steak sauce, hardwood smoked bacon and cheddar cheese. Ground chuck mixed with pulled pork, topped with coleslaw and BBQ sauce. Ground chuck patty rolled in a Cajun seasoning mix and topped with blue cheese sauce. Ground chuck mixed with jalapenos, habaneros, poblanos, red pepper and New Mexico chili peppers. Topped with pepper jack cheese and Tabasco aioli. An old fashion burger with or without cheese, topped with lettuce, tomato, pickle and onion. Sliced tenderloin on a toasted hoagie with aioli, lettuce, tomato, red onion and swiss cheese. Grilled chicken breast on a toasted brioche bun with avocado mayo, lettuce, tomato, pickles and onion. The classic 3 layer club sandwich on toasted white bread with ham, turkey, smoked bacon and cheddar cheese. Cooper's own chicken salad served on toasted white bread with cheddar cheese. Excellent meat, excellently cooked. Nice meal. The ambiance is nice, you're eating in a little part of a meat market. Good service. Excellent wine selection on the menu, but no other drink options listed. Since I don't drink wine I just drank water, because I didn't want to ask for something not on a menu. I would definitely recommend the place to others. I had an aged ribeye, which was flavorful and cooked quite well. I love Coopers. Food very good - restaurant is small and pleasant. My favorite burger is at Cooper’s and I like that it’s also a great meat market. My friend had salmon and loved it too. Try it you’ll like it!!! The food was great, the only problem we encountered was the wait, it took an hour and a half to get our food after ordering. It was on a Saturday night and they were full but still that should not happen. They apologized and brought us two servings of bread. Date night..... we loved everything about this spot. We will definitely return. Was at Cooper's for lunch on Wednesday...it was $10 burger Wednesday, and I and my two companions jumped in. I will not babble on unnecessarily. It may be one of the two or 3 best hamburgers I've ever had. Planning to go back for dinner ASAP to see if the steaks are equal to the challenge. I suspect that I will find greatness in the moment! Absolutely fantastic! We had a variety of cuts of steak at our table and each one was excellent. For sides, the brussel sprouts and the mushrooms were especially good. Our waiter, Jeremiah, was outstanding. He was extremely helpful and his wine recommendations were great. Excellent food and service. Unique environment and not too stuffy. Will go again. This quaint little market with the dining room adjacent was fantastic. I plan to go back. I definitely enjoyed the steak and wine. the Brussel Sprouts to die for. The mash potatoes to dry for my taste, but flavorful. The service was MAGNIFICENT....Jeremiah provided excellent service. I will definitely suggest this place to my friends. The Kitchen at Cooper’s Meat Market was outstanding!! The ambiance is casual and inviting. Tuna Tartar, Carpaccio, Sautéed mushrooms, Brussels Sprouts , Filet Mignon, you name it - all fantastic. However, the best part of the entire evening was our server Jeremiah! He provided us with exceptional service and made our dining experience even more special and memorable. 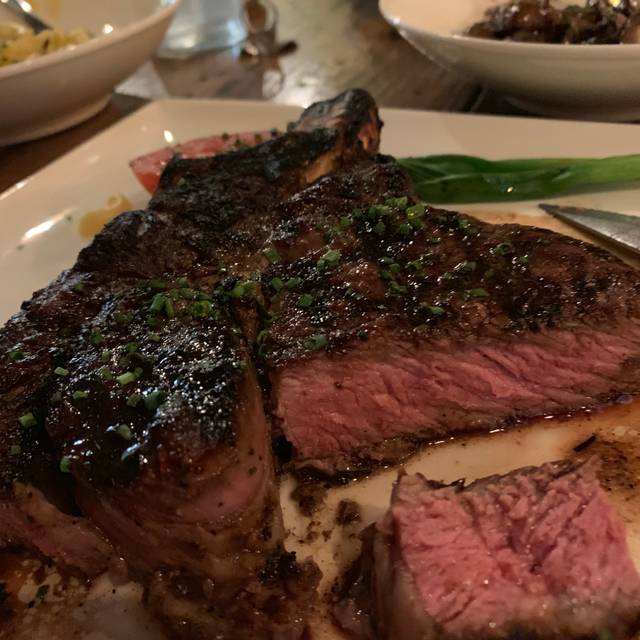 I have dined at most of the steak houses in and around Dallas and this is quite possibly the Best steak in Dallas. The wine list is somewhat abbreviated but well thought out and reasonably priced. We had 15 in our party and everyone enjoyed the beverages and meals. We'll be back for sure. Great concept and steaks with a great charred crust. Staff were pleasant and a diverse wine list. Another great evening. Some of the best steaks in town. A real hidden gem! Chefdave, thank you for the review. We are so happy to hear that you enjoy our steaks, we strive pretty hard to offer quality meats. I convinced my co-workers to try out Cooper’s Meat Market for lunch. Jeremiah greeted us and had our waters ready! We started with the bacon wrapped shrimp which was served with flash fried spinach greens, they were perfect! We also tried the beef carpaccio which was equally divine and buttery! Everyone ordered a burger. The wait was a little long but I figured it’s worth the wait. I split the chophouse burger with a co-worker with they plated as such with fries. The fries were still hot! The burger cooked medium rare as requested was full of flavor. We added a side of horseradish! All plates were emptied within minutes! Can’t wait to go back for dinner or even pick up prepped food from their freezer! The steak was delicious. Lots of amazing pre-prepped food in the fridges. Great lunch! The burgers are excellent. Will be back. The food was delicious! Two couples dining together on a Monday night. Filets were seasoned and cook to each order perfectly. Cooper’s Special salad as well as the Caeser salad were wonderful. Great selection of beers, ciders and wine. Banana bread pudding with caramel sauce is not to be missed! The Flourless Chocolate Torte was great for chocolate lovers. A really nice dinner experience! Sensational steak, and the shrimp Lizzies are to be believed. Nice, reasonable wine list, too. Food was outstanding and Jeremiah provided an excellent dining experience. Awesome meal, impeccable service from Jeremiah, comfortable warm ambience. Exactly the steak experience I was looking for, exactly not the stuffed shirt dinner. Great experience! Delicious food and super friendly staff! Thanks for being awesome - we will be back! Great food in a unique atmosphere. Our server, Jeremiah, ensured a great experience! The food is was outstanding plus the portions were huge. Jeremiah’s service and suggestions were top notch. We will definitely be coming back. Excellent quality and value in a neighborhood setting. Our rib eye was cooked to perfection, Fabulous spicy champagne mimosas. Great service by Jeremiah and Rolando..
Cooper & Rolando were great! Food was amazing, especially the steak. The music made the atmosphere feel like a country store but that can be changed. Jeramiha showed us a great time! Casual dining and upscale food. Great wine list! When we thought we couldn’t eat another bite, all it took was Jeramia describing the deserts and there’re we were, eating even more. Glad we have another great steakhouse in the neighborhood..
Our first visit and we’ll be back. Loved the salad with tuna seared perfectly. Selena was a great server and accommodated our requests. Pleasant location for an afternoon with friends. We visited a month ago and took out of town friends back. Food did not disappoint the second visit. Coopers has one of the best steaks in Dallas and the sides are family style and good. Jeremiah was our waiter both times and it was amazing what he remembered about us from our first visit. I will definitely ask for Jeremiah when I visit agan. We had a great experience on our first visit to The Kitchen at Cooper's Market. Our waiter, Jeremiah, was attentive and informative. We had the steak tartare for an appetizer. It was excellent. 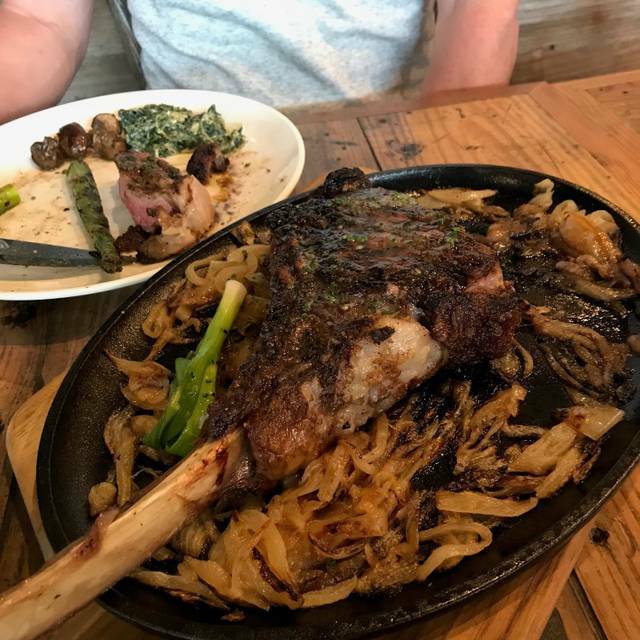 We had the special tomahawk ribeye for our entrée. It has huge, plenty for two people and we had leftovers. 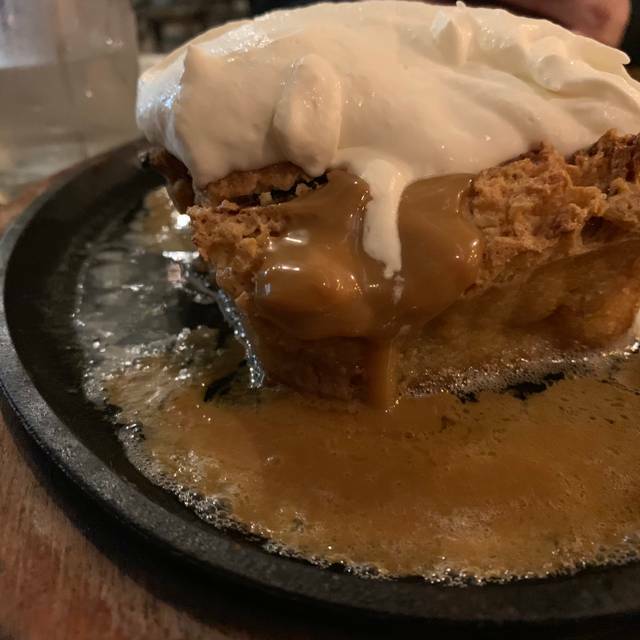 It was cooked to the perfect temperature and melted in your mouth. We loved the relaxed atmosphere with fine dining quality food. We will be back! Service and Food was AMAZING! Glad to have discovered Cooper’s Meat Market. Not only is the food great, they also have meats, beers, and wines.